What is a World Circumnavigation? Webster’s 9th Edition defines a circumnavigation as: to go around instead of through. For example, a circumnavigation of an island would be a journey that completely encircles the landmass. On a flat plane, a circumnavigation is a simple concept; however, defining a circumnavigation of the earth is more complicated due to the spherical characteristics of the planet. It could be stated that a circumnavigation of the world is a journey of 40,075 km or 24, 901 miles (the circumference of the world at its widest point) following a perfect circle around the planet. 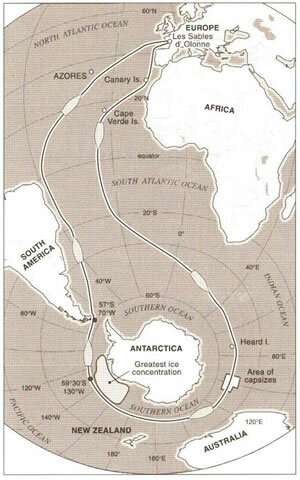 An example of the infinite possibilities for such a route would be following the Equator around the world. Another possibility would be a journey tracing the first and 180th meridian and intersecting both poles. In reality, due to physical and political barriers, it is impossible to follow such an arrow-straight route, therefore guidelines have been created to dictate how far a journey can stray from a great circle route (a perfect circle of 40,075 km) and still be classified as a circumnavigation. When envisioning a circumnavigation of the world that crosses both land and water, it is important to tie references to the globe itself and not to manmade reference markings such as the equator or specific meridians. For circumnavigations restricted to the boundaries of the ocean or land (such as journeys by bicycle or sailboat), the journey guidelines must take into consideration the physical boundaries of the regions traveled along with reference to the globe itself. When we completed our expedition only one set of established guidelines existed for circumnavigations covering both land and oceans and thus not restricted by those boundaries. Those were established by the Federation Aeronautique Internationale (F.A.I.) for aerial circumnavigations. Two other sets of guidelines were in place for circumnavigations that were restricted to either land or water. Aircraft have the ability to fly over land and water which allows for a route closer to a perfect circle than a nautical global circumnavigation does. There is only one organization that sets guidelines for such a route around the earth: the Federation Aeronautique Internationale. For a powered aircraft to officially circumnavigate the world, FAI stipulations include that it must cross all meridians in one direction, travel a distance of at least 36,787.559 km (the length of the Tropic of Cancer), and complete the journey at the point of departure. Each leg must commence at the exact point where the previous finished off. There is no requirement that it cross the Equator or touch antipodal points. An official nautical circumnavigation of Earth according to the World Sailing Speed Record Council includes the requirements that the vessel start from and finish at the same port, cross all meridians of longitude, cross the equator, and travel at least 21,600 nautical miles. Each leg must commence at the exact point where the previous finished off (this means legs cannot be completed out of order). There are no requirements to reach antipodal points. Unlike a circumnavigation crossing both land and water, a nautical journey must acknowledge the borders of the ocean as boundaries that can’t be crossed. Because of this, when defining a nautical circumnavigation of the world, the globe cannot be regarded as a faceless sphere, but tangible borders must be addressed. The equator is in relation to these boundaries, therefore can be used as a valid reference point. For journeys restricted entirely to land (such as walking, driving, cycling, etc) it is necessary to travel a minimum of a predetermined distance on the land masses of several continents. It is not necessary to finish at the starting point. Second source references indicate that Guinness defines a terraineous circumnavigation as being a journey which includes covering at least 28,970 km (18,000 miles) during a journey of 40,075 km (24,900 miles), and touching at least four continents. When we began our human powered circumnavigation on June 1, 2004, no organization had created specific guidelines for such a record breaking attempt. Since the F.A.I. (guidelines above) provided the only established guidelines for journeys encompassing land and ocean, these were used in designing the route. A circumnavigation involves a journey that starts and finishes at the same place. Our journey began and ended in Vancouver, Canada. The total distance traveled must exceed the length of the Tropic of Capricorn, namely 36,787.559 km (22,858.7 miles). The distance we traveled was 43,000 km ( miles). All lines of longitude must be crossed. Each leg of the journey must resume at the exact point at which the last ended. Circumnavigation Route Followed by Our Team. Although no specific guidelines had been created for a human-powered circumnavigation, it could be assumed that following the same stringent criteria required of a jetliner would be sufficient for a self-propelled human. The 250,000 horsepower thrust of the Concorde’s engines allow it to power into the strongest jet streams and stay within a few metres of a great circle route – in other words there is no form of transportation more capable of tracing a perfect circumnavigation of the Earth. It would be tough to argue that the requirements of a human-powered circumnavigation of Earth be more stringent than that required of a supersonic jet plane. Reaching two antipodal points (points on the earth directly opposite one another) used to be a requirement in historical world circumnavigation rules. This criterion has since been dropped in all modern guidelines. Guidelines for circumnavigations by helicopter, sailboat, dirigible, jet plane, or any other conceivable transportation do not need to reach antipodal pairs. Although a perfect great circle route around the world would touch the equator (and infinite antipodal points), existing guidelines are not created to mirror the realities of a perfect circle, but to set criteria as to what are acceptable deviations from a flawless circle. Depending on other basic requirements that have been incorporated into the guidelines, an equator crossing may or may not be deemed necessary. With the FAI rules, for example, the minimum distance that must be traveled is 36,787.559 km (22,858.7 miles). A perfect circle of this length can be drawn around the world that neither crosses the equator nor reaches antipodal pairs, therefore these criteria are not included in their guidelines. For a circumnavigation of the world that crosses both land and water (such as air or human-powered), it is more appropriate to tie references to the globe itself and not to manmade reference markings such as the equator or specific meridians. Whereas journeys restricted to the boundaries of the ocean or land (such as journeys by bicycle or sailboat) must take into consideration the physical boundaries of the regions traveled along with reference to the globe itself. How About Guinness World Records? Guinness World Records specializes in recording and validating records. For most feats involving the complications of geography, Guinness adopts rules that have been created by organizations with greater authority and knowledge on the subject. Guinness uses the rules created by the F.A.I. in validating aerial circumnavigations and the World Sailing Speed Record Council’s guidelines for nautical circumnavigations. When we began our human powered circumnavigation, Guinness World Records did not have guidelines for human powered circumnavigations. Our team repeatedly contacted Guinness prior, during and after our circumnavigation for information on their guidelines and to see if they would be interested in recording the event. Guinness only responded once and that was to say they would not be interested in covering the feat. From a geographical perspective, including an equator crossing in their guidelines does not make sense. Guinness states the total distance that must be traveled is a minimum of 36,787.559 km (the length of the Tropic of Cancer). If one were to travel a route precisely following the Tropic of Cancer, for example, she would not have achieved a circumnavigation according to Guinness. If the axis for this exact same route were shifted a few degrees so the equator was touched Guinness would categorize it as a circumnavigation. Guinness World Records endorses the FAI requirements by recognizing feats that have adhered their guidelines. For example, the Guinness record for the fastest circumnavigation of the planet (excluding orbiting space craft) is held by Air France for a Concorde flight that lasted just over 31 hours, and was completed entirely within the northern hemisphere. We have not yet recieved a response from Guinness regarding their decision making process and invite them to have their definition reviewed by a team of unbiased geographers. Are there any other Human Powered Circumnavigations? There are three ongoing attempts at circumnavigating the world by human power: American Dimitri Keiffer, American Erden Eruc, and Briton Jason Lewis. Jason Lewis is expected to complete his journey in October 2007, while the other two have not yet posted expected completion dates. Lewis has erroneously claimed that he will be completing the first human-powered circumnavigation of the planet. In his news releases and media interviews he says his will be the first, even though his journey will be completed 15 months after Colin Angus’ expedition. He dismisses Angus’ expedition arguing it does not comply with guidelines Guiness created after the expedition. Lewis, however, has failed to meet the Guinness criteria with his own expedition. Lewis did not complete the expedition exclusively under his own human-power.Guinness World records has recently made an alteration to the wording of their rules to clarify that one must exclusively use his or her own power (ie. not aided by a team member) to complete an official human powered circumnavigation. “Human-powered means something powered by a single traveler only, all vehicles used cannot be propelled by multiple persons (rowing tandem, etc.) – March 1, 2007 Guinness Records TeamJason Lewis crossed the oceans with various partners and they took turns powering the craft. Lewis completed the expedition legs out of order. Guinness specifies that a continuous route is required for an official circumnavigation:“Each leg of the journey must resume at the exact point at which the last ended.” – Guinness Records Team. Near Australia Lewis received a tow from a motorized boat to avoid being washed onto the reef. He continued with the expedition from the shore leaving a gap in his route. Much later Jason Lewis returned to complete this gap. Interestingly, Jason issues these words in face of the fact that for the first two years of his own expedition he planned to follow a route almost the same as what Colin Angus completed – the route that he now states is part of a “fraudulent claim”. When Jason Lewis outlined his own circumnavigation plans to dozens of media outlets he never once said his proposed route was fraudulent (Read one of these articles published by The Telegraph). Two years into his expedition Jason Lewis modified his route, most likely because of the difficulty of crossing the Northern Pacific, and instead followed a path that was confined mainly to the tropics. Spot the difference between these routes. The route Colin Angus followed for his human-powered circumnavigation. These routes are almost identical, and both are contained within the northern hemisphere. Oddly Lewis labelled his own attempt as a circumnavigation route, however, when Angus completed the same route, Lewis called it “fraudulent”. John Rasmus, Senior Editor of National Geographic Adventure Magazine calls it a case of “sour grapes”. Neither Jason Lewis nor Colin Angus have completed a circumnavigation according to the rules of Guinness. Colin Angus contacted Guinness prior to his expedition and they said they were not interested in being involved nor did they indicate that they would create rules. Colin followed the only rules in existence for a circumnavigation that spans land and water, which were delineated by the FAI. Colin Angus completed his journey around the world May 20, 2006. Jason Lewis will be completing his journey around the world in October 2007. No guidelines for human-powered circumnavigations were in existence when Colin Angus completed his circumnavigation. Guinness issued a set of guidelines 7 months afterwards. The first circumnavigation of the world was completed by a Spanish sailing expedition captained by Ferdinand Magellan (Portuguese). The voyage was completed in 1522. Magellan himself was killed on the voyage, although 18 of his crew made it to the end and became the first humans to circle the planet. The first circumnavigation of earth by plane was completed by the United States Army Air Service in 1922. The fastest circumnavigation of the earth was completed by Air France with a Concorde flight lasting just over 31 hours in 1995.